Toronto Employment Lawyer: Howard v. Benson Group Inc. Fixed term contracts of employment, ie contracts for a specified period of time such as six months, are one of the most common forms of employment relationships. With the decline of full-time permanent positions, contract employment has become more and more common within the job market. Howard v. Benson Group Inc. is a groundbreaking ruling from the Ontario Court of Appeal that provides fixed-term contract employees with additional protection when it comes to early terminations, which will no doubt have a significant impact on many employees across the province. Mr. Howard was an employee of an automotive service centre in Bowmanville, Ontario first in the position of a Truck Shop Manager and then as a Sales Development Manager. He was employed pursuant to a fixed-term contract with a five-year term, commencing in September 2012. He was subsequently terminated without cause 23 months later, with just over three years remaining in the employment agreement. Mr. Howard brought an action for wrongful dismissal and breach of contract, seeking damages equal to the salary he would have received during the remainder of his fixed term employment contract. At a motion for summary judgment, the motion judge held that although Mr. Howard’s contract did not containing an enforceable termination clause that allowed Mr. Howard’s employer to terminate his employment early without cause, Mr. Howard would not be entitled to damages equal to the remainder of his contract. 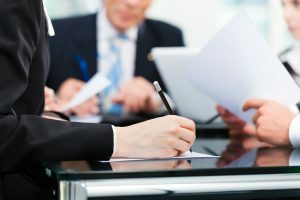 The judge’s reasoning was that there was a clear intention of the employer to limit its liability at termination within the contract despite the finding that the applicable clause was unenforceable. As such the motion judge found that Mr. Howard would only be entitled to ‘reasonable common law notice,’ an amount significantly less than the remainder of his contract. In addition, the motion judge held that Mr. Howard’s entitlements would be subject to a duty to mitigate – that is Mr. Howard must try to minimize his losses by searching for alternative employment. Mr. Howard appealed the decision. 2) an award of damages for early termination of the Employment Contract is subject to a duty to mitigate. The court held that the motion judge erred on both issues. The motion just erred in finding that Mr. Howard would be entitled to common law reasonable notice rather than the remainder of his fixed-term contract. Citing numerous cases, the principle is that in circumstances where there is no early termination clause, the fixed-term contract unambiguously ousts the common law presumption of reasonable notice on termination by providing a clear end date to the employee. In this case, the court found that the employer was not an unsophisticated party; if they sought to limit their liability at termination to common law notice, they could have very well included a clause to do so. However, in the absence of an enforceable clause, the common law presumption of reasonable notice is clearly replaced by fixed end date of the contract. Mr. Howard would thus be entitled to the remainder of his employment agreement in damages. Importantly, for the first time in Ontario jurisprudence, the court held that the duty to mitigate does not apply in the case of fixed-term contracts that do not have mitigation clauses. While the Ontario Court of Appeal has produced decisions with similar principles (specifically their ruling in Bowes v. Goss Power Products Ltd., 2012 ONCA 425, a case that held that the duty to mitigate does not apply to damages based on a fixed-notice ­termination provision), it had not yet been applied to a fixed-term contract. Certainty is just as much a feature of a fixed-term contract with no early termination provision as a contract term requiring an employer to pay an employee a stipulated sum if it wishes to invoke an early termination provision in a fixed-term contract or a termination provision in an indefinite-duration agreement. An employer who ends the employment relationship in a fixed-term contract before its term expires must pay the employee the value of the salary and benefits the employee would have received had he or she worked throughout the remaining term of the contract. If the parties wish to modify that obligation they should unambiguously say so. Based on this principle, the Court of Appeal in Bowes held that damages that arise out of a fixed-notice termination clause are not subjected to the duty to mitigate. Just like fixed-term termination provisions, a fixed-term contract provides the employee with certainty, in that it provides a definitive end date for the employment. The Court held that there is no reason to depart from the rule in Bowes that there is no duty to mitigate where the contract specifies the penalty for early termination. It does not matter whether the penalty is specified expressly, as in Bowes, or is by default the wages and benefits for the unexpired term of the contract, as in the case of fixed term contracts generally. If the employer wished to include an employee’s duty to mitigate, it should be included within the employment agreement. As such, the appeal was allowed for both issues. Mr. Howard is entitled to the remainder of his fixed-term contract as damages and those damages are not subject to the duty to mitigate. What may have been a few months’ notice pursuant to common law reasonable notice, became just over three years’ worth of salary in damages that the employer was required to pay. This decision in Howard clarifies an important issue in the ‘gig economy’ that is rife with fixed term contracts and alters the field of employment law, similar to the Court of Appeal’s previously ruling in Bowes. Employees with a fixed term contract that does not contain an enforceable early termination provision will now have greater protection should they be terminated prior to the term’s conclusion. With the damages not subject to the duty to mitigate, employees may be able to effectively double-up on their entitlements if they were to secure a new job early. Employers should be cautious about the use of fixed term contracts for employees as it creates uncertainty and exposes employers to significant liability in the event of an early termination. If you are an employer who requires assistance drafting a contract or are an employee who has been terminated with a fixed-term contract, contact Monkhouse Law today for a free consultation.